Elymaids. Phraates. early 2nd century AD. 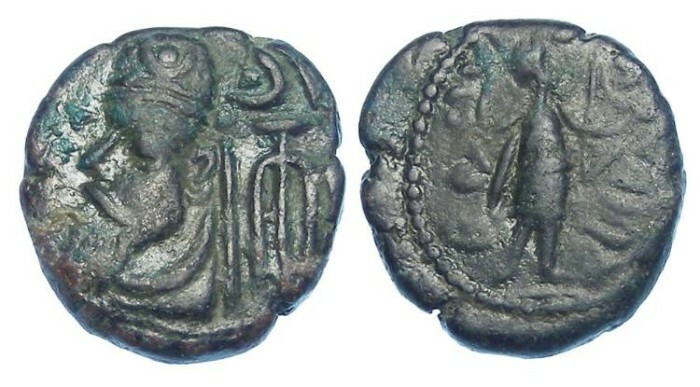 Bronze drachms. Elam was a Parthian vassel state in the Persian gulf region, with it's capital at Susa. Phraates was the son of the Elymaid king Orodes. Size : 13.9 x 15.4 mm. Weight : 3.14 grams. Grade : aVF with a dark brown patina. Slightly soft strike. Reference : Mitchiner 710 variety. Obverse : Bust of the King left, with an anchor symbol behind. Reverse : Artemis standing right, holding a bow and drawing an arrow from a quiver, with a corrupted Greek inscription around.